For all of those folks wondering if the guys behind The Chainsmokers are still producing music or busy clicking selfies, this post will clear most of your doubts/misconceptions! Here are some trivial and must-know facts about the EDM duo that’s triggered a global phenomenon and most importantly; about their much anticipated tour with Vh1 Supersonic Arcade! Their appeal derives from the fact that their signature musical style incorporates unique dance music melodies, indie vocals and rhythmic beats, when mixed in the right proportions give the perfect recipe for a party popping chart buster and sometime(s), even a global phenomenon! Incase you thought they’re just another one-hit wonder, you couldn’t get further apart from the truth! What if we were to tell ya that currently, all of their remixes have all found their way onto Hype Machine’s popular charts, all charting in the Top 3 with over +100k plays each, and their last FIVE remixes have all charted consecutively at #1. Way before we all knew them, Priyanka Chopra had already collaborated with them in 2012 in a track called Erase! Incase you haven’t heard it yet, here you go! The Chainsmokers “#SELFIE” began its climb to the top of Billboard’s Hot Dance/Electronic Songs chart with help from the audience who helped the duo create a video that featured selfies from celebrities such as Aoki, David Hasselhoff and Vampire Diaries star Ian Somerhalder. The Grammy-Selfie also posed as a catalyst to the duo piggybacking off Ellen’s group Grammy selfie with a 15-second clip of the photo’s staging, with the song’s hook, posted to Facebook. Now coming to the most important part of all, as part of the VH1 SUPERSONIC Arcade series,following Steve Aoki(the record label owner of #SELFIE! ), The Chainsmokers will perform in Mumbai, Delhi and Bangalore this month along with numerous other artists. In order to reach out to those sections of fans who can’t make it to Goa during the festive week following Christmas, this initiative has been taken by VH1 Supersonic. After all, a sneak-peek never hurts, does it? 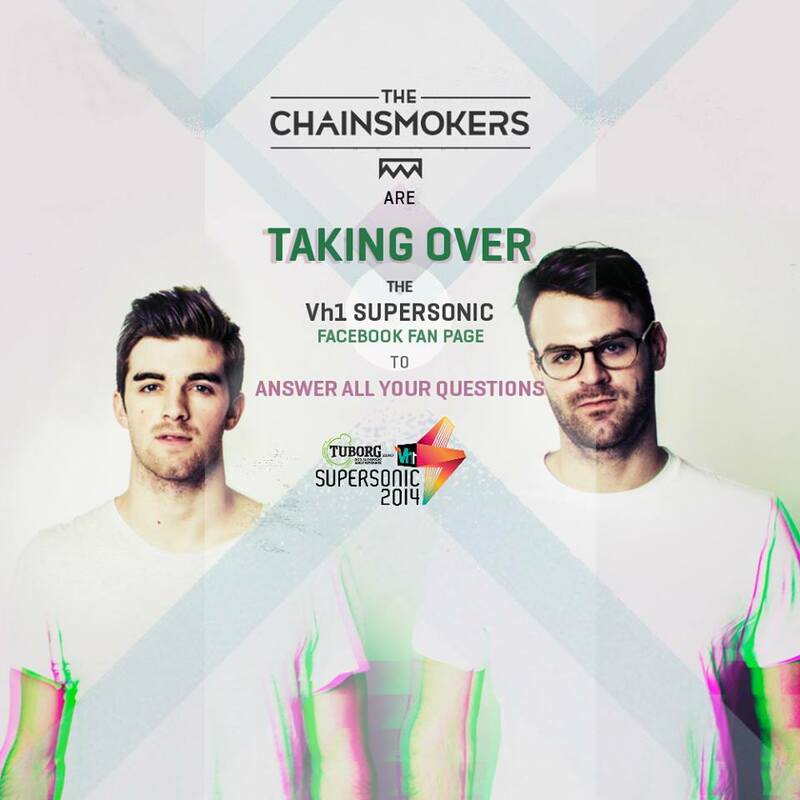 The Chainsmokers will also be having a Q/A session on Supersonic’s Facebook page at 5 pm,14th November: https://www.facebook.com/Vh1Supersonic . Go bonkers! Until then, happy selfie’ing mates!Also, don’t forget a selfie a day, keeps the week blues away. To enhance your selfie experience, here are some useful tips by the legends themselves! Previous article Vh1 Supersonic has a new stage in town, ‘Bass Stage’ !